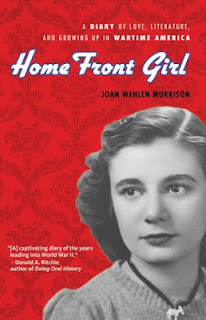 Home Front Girl is the diary of Joan Wehlen Morrison written before and during the build-up to WWll and was discovered by her daughter, Susan Signe Morrison, after she died and then edited and published. The book is such a surprising and unexpected pleasure as the Recommender hadn't heard of it before coming across it in a list of recently released titles. Joan is a wonderfully observant, funny and smart girl. It begins when she is 14 and takes us up to when she turns 20. The diary records her thoughts on her life and daily activities living in Chicago. And she is one busy girl. From a young age she wrote columns in school newspapers including an advice column. It is no surprise that she grew up to be a journalist and a professor who co-authored Mosaic: The Immigrant Experience in the Words of Those Who Lived It and From Camelot to Kent State: the Sixties Experience in the Words of Those Who Lived It. Right from the start Joan records events like the Hindenburg zeppelin fire and the coronation of King George and applies them to how they affect her life, for instance "Coronation or no coronation...there was school today." It often seems a slower, sweeter time. Joan walking home from a trip to the Art Institute and the library where she borrows a work by Kipling and writes: "Walked home along the lovely lake with elongated purple shadows along the sands. Still bright haired children playing. Still flowers no less vivid or sky less blue, sun like blood in the West. Oh, I felt the glory and the spring of Kipling's poem, "But as the faithful years return and hearts undaunted sing again". Isn't that a lovely thought- "hearts undaunted sing again"-though ever the years are long and hard-the Spring will always come and our hearts can sing again- oh how beautiful"
Is that not more beautiful than a text? She wrote this in 1937, when she was 14. In school she takes Latin and German. She recites poetry and writes her own. She writes a multitude of observances on the boys who come and go through her school years, many funny, some angry and others poignant. She spends summers working at children's camps to earn extra money. She is tested for TB and found to be susceptible to it and has to be tested periodically. She receives a scholarship to the University of Chicago Jr. College. And then, there's the war. She chronicles events that lead up to the start of WW ll. On Feb. 13, 1938 she writes about the US, England and France requesting Japan cut down on her navies. She talks to a boy in her class about war and death. "He seemed sure that there'd be another war (another, oh!) and he said he'd probably be killed in it. All the boys I know will be old enough to die in a war in 1940." Joan is afraid of what the impending war will do to her life and that of her friends. She is a pacifist, which seems unusual for those times, and has many thoughts on what war does to the people of the USA and the other countries affected. I could go on and on, because this book is just so quotable... but really, you want to get a copy of Home Front Girl for yourself so you can curl up with it and let Joan take you back in time, as you see the world through the eyes of this appealing narrator. Dan Waters: Live and In Person!